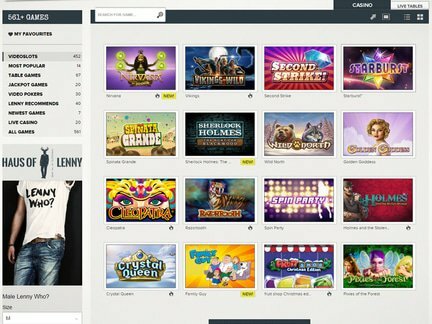 SuperLenny Casino's main page is designed in a stylish manner. The player gets to choose between a sportsbook and an online casino. The front page video features a guitar player who is obviously taking inspiration from his favourite rock n' roll artists. This funny video is a great way to showcase the fact that the casino is all about wild adventure and freedom! The players are suppoosed to see the boundless opportunities that await them inside the venue. A large-scale bonus package is presented, so that the players can catch a glimpse of the opportunities. The SuperLenny Casino Bonus deal package consists of a €150 bonus and 150 free spins. It surely gets the average person excited about the benefits that come with the promotions. In order to take full advantage of the offer, the player must simply click on the deposit button and select the payment method of choice. This could be one of the following payment options; Visa, MasterCard, Maestro, Neteller, Skrill, PaySafeCard, Euteller, iDeal, etc. The minimum deposit is €20. While the welcome bonus deal is indeed superb, it is surprising to see that the promotion section has not included any alternative offers. Rival online casinos seem to provide a much wider range of promotions. The lack of options may turn some players away from the casino. The residents of certain countries are forbidden from making a deposit. The restrictions apply to visitors from the following locations; Algeria, China, France, Hong Kong, Indonesia, Korea, Malaysia, Turkey, United States, Italy, Singapore, Ireland, Romania, Portugal, etc. At this point in time, the casino supports four languages (English, Finnish, Norwegian & Swedish). Since the casino has a UK License, it can count on large traffic from Brits. Canadian and European players have also shown tremendous loyalty to the venue. Eighteen games have been featured in the „popular game" column. Not surprisingly, the list of the most popular games opens with Starburst, a leader in attracting casino traffic. It is a 5 reel slot game with some eye-catching graphics. The official NetEnt website allows the player to preview the game without putting down any money. It's good to visit the site, if one wants to get a mental image of what it's like to play Starburst. Other popular games would include; Spinata Grande, Gonzo's Quest, Red Hot Devil, Mega Fortune, Universal Psycho, Twin Spin, The French Roulette, Dead or Alive, Jack and the Beanstalk and a few others. The level of resolved complaints is so high that the casino staff can be congratulated for being so active in this area. The claims have been evaluated and resolved upon request. 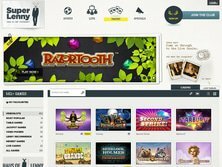 This makes the average player happy, as shown by the response that the casino routinely gets from the online casino community. When one examines the player ratings, a picture of a solid casino emerges. Live chat, e-mail and telephone support is available on the quality entertainment website. SupperLenny Casino is operated by Betit Operations Ltd. They are regulated by the Malta Gaming Authority, a highly respected licensing body. This license was issued in 2013. Another license comes from the equally respected Gambling Commission of Great Britain. Together, the licensing package makes the casino look credible in the eyes of reviewers. After all, the requirements for obtaining these licences are demanding. The evident lack of promotional deals is disappointing, especially since the casino is doing such a great job with the entertainment. The games are very engaging! I am especially thinking of some of the graphic-rich slots on the website. It wouldn't hurt the casino to give something back to the player in the form of bonuses and free spins. The casino staff has already indicated that they are going to be active in resolving any complaints that are posted on public forums, so there is still reason for hope.